It really is no secret that I love rain. I tell everyone I meet. Ok, maybe not everyone. It started raining Tuesday night and I thought "Just my luck. Rain at night and none during the day." Then I was surprised yesterday afternoon when it started pouring down rain. YEA! Connor, who probably likes rain even more than I do, asked "What's that sound mama?" I told him to go look out the window, that the sound was rain. He then asked if we could go out in it, because, of course, he is my child. So we did. I don't even know why I try keeping Connor dry. He purposely gets himself all wet. I may as well send him out in a bathing suit! 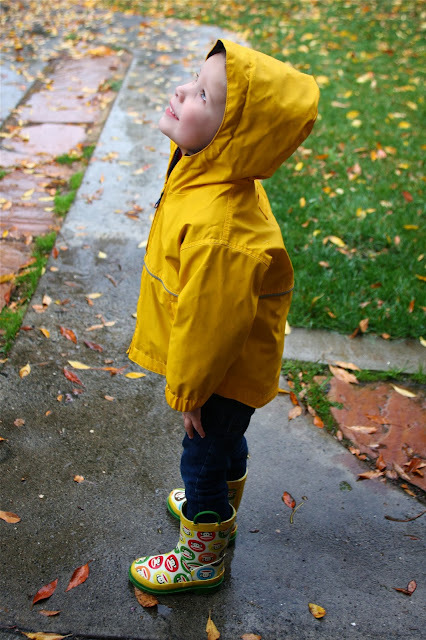 But really, there is almost nothing cuter than a kid in ran boots and a rain jacket. So I'll keep doing it, even if it doesn't make sense. Plus, this is Connor's third year wearing that same jacket. Sadly, I think it will be his last. But, we have had some good memories with that jacket. I know, I can't believe I am saying that about a piece of clothing either! Most of the time Connor actually wanted me out in the rain with him. So we spent a lot of time jumping in puddles together and kicking water up at each other. A few of my neighbors drove past and waved. I'm pretty sure they all were jealous that they too weren't playing in the rain...or they thought I was totally crazy. One or the other. It's things like this that I really love about having children. You can totally be a kid again yourself and when people think you are crazy you just blame it on the kids!!! But seriously, it was fun. And I love the rain. Oh, and if you are wondering where Isla was, she was napping. She always misses out on the nap time fun. But really I think a nap sounds pretty dang great too! They were totally jealous of you & your adorable little man! Those days of rain were the best. I was thinking the same thing on Tuesday.. OH MAN! I was pretty bummed that Aubrey and I were going to miss it, then the down pour the next day was just what we needed. :) I love all of these pictures of Connor. I can't wait to see Miss Isla join in on the fun. We need more rain!